The Linear Motor (LM) tube and armature design were developed and optimized by MSA utilizing electromagnetic finite element analysis (FEA), photographs from which are depicted in Figures 1 and 2 below. Magnetic flux, generated by the permanent magnets, flows through the de-energized coil, through the steel wall of the pressure-tube, and through the steel of the plunger, forming a closed loop. In this condition, the axial force, from each of the two permanent magnets, cancel each other out. Figure 1 depicts this condition. Note the lines of flux only appear in the area of the permanent magnets. A balance exists between the flux generated by each magnet, so no motion occurs, and the plunger remains in the center (neutral) position. When the coil is energized, in either polarity, the flux produced will assist the flux from one permanent magnet and oppose the flux from the other permanent magnet. Figure 2 depicts this condition. Note that the magnetic flux which is generated by the energized coil flows through the tube, through the plunger, and across the air-gap created by the brazing ring. In this polarity, the flux from the coil assists the left permanent magnet and opposes the right magnet. This “assistance” increases the flux flowing through the left-hand edge of the brazed ring and weakens the flux on the right-hand side. The flux “imbalance” generates a net force, and, in this case, movement is to the left. Reversing the polarity (direction) of the current in the coil will reverse the direction of the flux through the coil/frame/plunger, which then reverses the direction of the resulting net force (and movement). Empirical Testing was performed on a 19mm LM tube, with a standard 37mm diameter coil (which is exactly the same coil that is employed on unidirectional tubes). 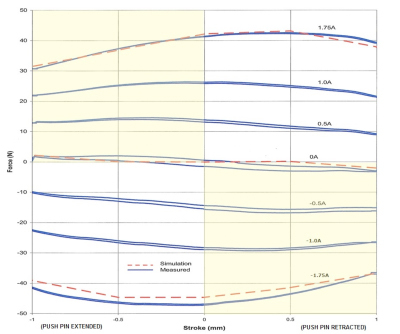 Figure 3 shows the force vs. stroke characteristics over the nominal working stroke of 1mm, for various currents. A maximum current of 1.75A corresponds to so-called “hot” conditions (i.e. steady-state current with maximum ambient temperature). The shape of these curves corresponds with the results of theoretical, 3-D modeling for all values of current. The maximum force of 42N in the center position (with positive current) is comparable to that of a similarly sized proportional, unidirectional actuator tube. The dynamic characteristics of the Linear Motor are extremely important for high-performance applications, especially for valves with closed loop control. Figure 4 shows the current vs. time response to a voltage step input, with the armature fixed in three different positions (null, push-rod fully extended, and push-rod fully retracted). 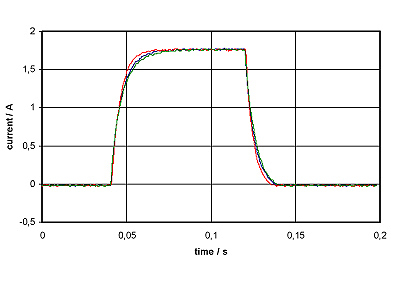 This response closely approximates that of an ideal inductor, with a time constant between 4 and 6ms over the full range of displacement. This is in contrast to proportional unidirectional actuator tubes, which exhibit a significantly slower, highly nonlinear current response, which varies even more with displacement. Figure 5 depicts displacement and current vs. time, for a voltage step input with the armature free to move (with centering springs installed). 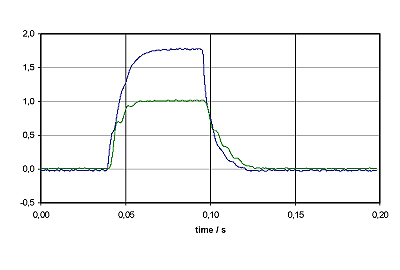 These results exhibit a linear current response, in spite of the oscillatory displacement response. By contrast, although proportional unidirectional actuators exhibit similar oscillatory displacement response, their nonlinear inductance characteristics result in a nonlinear, oscillatory, current response. 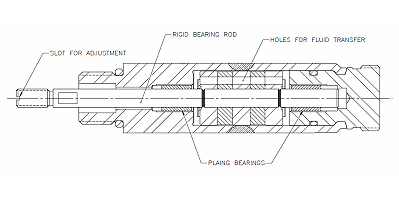 Additional samples have been explored to test the performance in a practical application, see Figure 6.
c. Holes have been added to all three plunger discs, and to the permanent magnets, to facilitate fluid transfer from one side of the plunger to the other. These design changes represent the current state of our production ready, Linear Motor reference designs. The MSA Linear Motor’s novel, bi-directional electromagnetic actuator tube and plunger design has been tested and proven to provide the push-pull motion which is required on many hydraulic valve applications. Utilizing only one coil, the bi-directional characteristics are achieved through the combination of the tube’s centrally located in-fill braze ring and the dual permanent magnet—triple steel-disc sandwich design of the plunger. The in-fill brazed pressure tube technology utilizes existing design and manufacturing methods, thereby confirming that the bi-directional tube is suitable for use in high-pressure systems. Test results demonstrate force and stroke characteristics that make this new actuator suitable for use in hydraulic proportional valve applications, which require push-pull functionality. Most importantly, the LM design concept can be scaled in size, and the force vs. stroke characteristics can be optimized to match the requirements of any new application. If you happen to have missed PART ONE of this series that covers Linear Motor Concept, Genesis of Development, Background and Physical Characteristics, and/or if you have not read PART TWO which describes LM’s Design & Manufacturing Techniques, and Performance & Functional Characteristics, we invite you to review both and subscribe to our website blog to receive email notifications of all posts. We want to thank you for the time you have invested in learning about Linear Motors, and encourage you to contact MSA with any questions you may have relating to your unidirectional and/or bi-directional electromagnetic actuator needs.